Acid, acid, and more acid! The soils around Munroe Falls are so much more acidic that where I live now in Columbus, the area is host to a suite of plants that I don't see much in Columbus, or not at all. 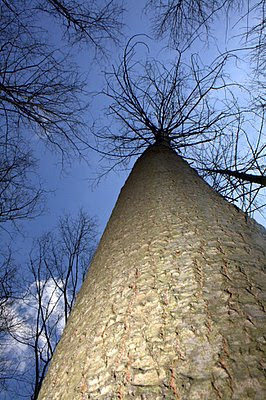 First up is the bigtooth aspen, or Populus grandidentata. 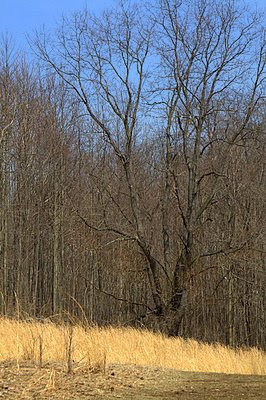 I've never seen this tree as much larger than this- typically they grow in old upland farm fields or in other waste area. 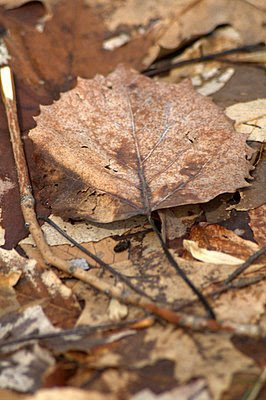 Check out the leaf, quite a good name, don't you think? There's nothing like a nature walk with the family. My dad suggested this park for Saturday's walk, it it was an excellent idea. My mom and brother sure had fun. The main trail at the park is named after this spring that flows right from the hillside, trickling down into a stream below. 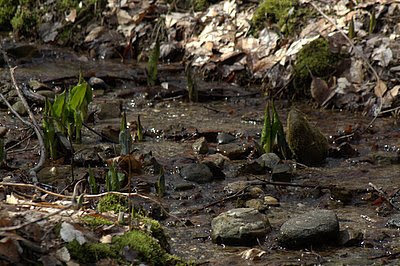 Skunk cabbage relishes these spring fed rivulets of water. Some of the upland open areas look they have been allowed to revert-this field is full of last year's growth of broomsedge, Andropogon virginicus, which is a grass (Poaceae) and not really a sedge (Cyperaceae) at all. 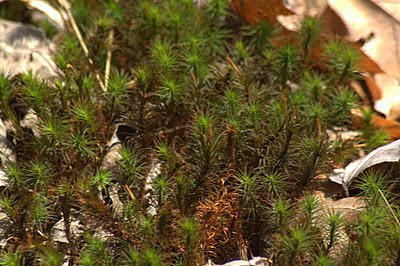 And in the young forest, the ground is carpeted with a really interesting colony of moss. This isn't tiny stuff- it probably gets 2-3 inches tall and each individual plant is as big around as a pencil. And finally, the last little bit of interest was this little pond, created by damming a small ephemeral stream. 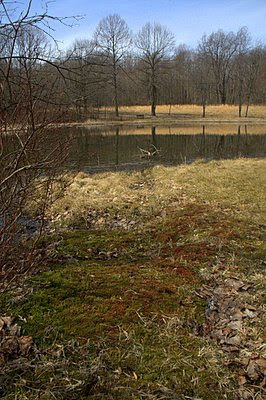 What was most interesting was the wooded edges of the pond, which were downright bog-like. Highbush blueberry shrubs grew here, and the ground was carpeted with a dense spongy carpet of Sphagnum species. In N.E. Ohio, you don't typically see Sphagnum in disturbed or successional situations, but here it was, growing on the edge of a disturbed pond. Give the moss 10,000 years, and who knows, maybe the pond will be a full blown peat bog. Ok, probably not, but I can wish! Hope you enjoyed our quick trip to Munroe Falls Metro Park! I did enjoy it very much. Have been viewing your blog recently. Always enjoyable. I was delighted to see that you made me a flickr contact as well. I was happy to reciprocate. 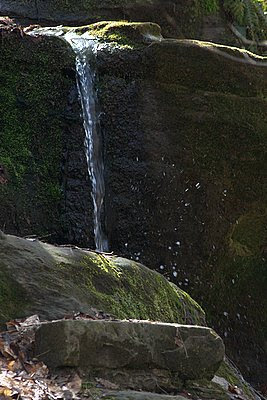 What beautiful pics and post of Munroe Falls. Love the family photo too. We have a lot of big-toothed and trembling aspen on our land. I love the aspen leaves whispering in the wind, chattering about what is happening around them. Bobbie- Thank you, I enjoyed looking at your photos on FLICKR. Do you shoot film? JJ- Thanks! I love quaking aspen, although that is also quite uncommon around central Ohio. Wonderful pictures. I especially like the first one of the tree. The perspective is terrific. Nice that you could get out for this nature walk with your family. I seem to be the only nature nut in my family. Linda- Thanks. I spent several minutes getting that shot just right. I'm new to flash, but I can see where it could be addicting. And Lana, yes, but not for long! Very nice walk. I like walks with stops along the way to observe some small thing. Unusual clouds, a new insect, a nice bird song, something new to photograph, a new way to photograph an old subject, etc., etc. This was enjoyable. Thanks for sharing. Tom: Great pictures from your walk in Munroe Falls. You take great photos. Troy- I'm glad you enjoyed this little walk. Sorry about the lack of green! Guy- Thank you very much!